Many new gardeners are starting to plan their first adventure into our crazy, wonderful world. Without a little guidance from seasoned veterans, they often choose seeds and plants that are more challenging than their budding skills can handle. These plant profiles will feature time-tested seeds and plants that are easy to grow, but produce a great show. Daylilies are some of the easiest perennials that a gardener can grow. They come in a wide range of shapes and colors and are hardy in a huge climate range. Regardless of your garden style, there is a perfect daylily for your landscape. Daylilies are originally native to Asia and as the scientific name, Hemerocallis denotes, the flowers are only good for one day. Hemera means 'day' and kallos means 'beauty'. However, that shouldn't prevent people from planting them. 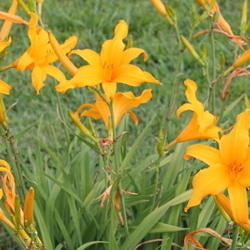 Each scape or stalk generally has a number of buds that mature over several weeks and a mature clump of daylilies can remain in bloom well over a month. Some even send up new scapes later in the season for a second show and those are called rebloomers. From their humble origins many centuries ago, the genus has been refined and thousands of hybrids created, so there are an almost unlimited number of choices available. Originally, yellow, orange and red were the only colors available and the flowers all had a similar shape. Now, there are also pinks, purples and near whites, many with unusual eyes, stripes and edges. Shapes range from a basic star shape to round, sculpted, recurved, crispate and spiders. Tiny little plants for the front of the border are available to towering giants with flowers the size of dinner plates. If you have a sunny area with average soil, you can grow daylilies. Plant daylilies in well-drained soil in a sunny part of your garden. They do best with regular water, but do not like 'wet feet'. When established, they are even drought tolerant, but don't expect a huge show. They have the ability to survive drought conditions, but for a lovely display, regular water or rainfall is best. Few pests bother dayliles. Japanese Beetles are sometimes troublesome, thrips can cause mal-formed blossoms (but generally leave on their own when conditions dry up) and there are a couple of fungal diseases that sometimes rear their heads, but for the most part, dayliles are tough and almost kill-proof. 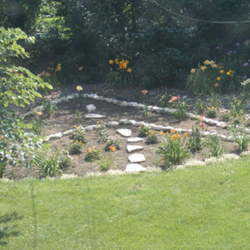 Getting started with daylilies is very inexpensive. Many friends and neighbors are usually willing to share a fan or two. A daylily fan is a self-contained little plant that multiplies via underground roots or stolens. Over the course of several seasons, two or three fans will increase to a substantial clump and each fan is capable of producing flower stalks or scapes. Many cultivars are affordable as well and hundreds of varieties cost less than $10 for a double fan division. Don't be afraid of the prices that some of the newer releases command. Only serious collectors and breeders shop in those groups and there are so many extremely affordable choices, it just isn't necessary. I don't believe I've spent more than $30 for any daylily and often much less. 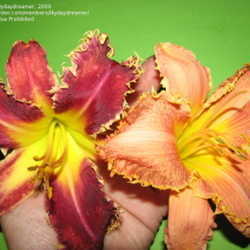 If you have several varieties of daylilies, it is quite easy to breed your own. Daylilies are some of the easiest plants to hybridize and lots of gardeners have fun with their back-yard breeding experiments. 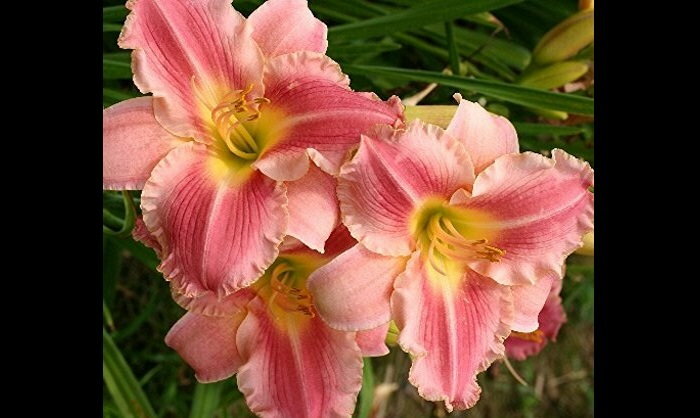 In fact, the only daylily in this article's images that is a named variety is the image of the pink ones at the top of this paragraph. It is Border Corssing. All the other images, including the thumbnail are of un-named seedlings. All you need to do is brush the pollen from the anthers of one flower to the tip of the stigma of another. This is usually done in the morning while the pollen is fresh and bees haven't had a chance to rob it. If your cross is successful, a pod will start to grow when the flower falls off. The seeds will be ripe when the pod starts to yellow and shrivel slightly, which is usually three weeks to a month. The seeds will change from a white color to shiny black when mature. You can then remove the pod and harvest your seeds. Let them dry inside for about a week and store them in the refrigerator. Seeds germinate best when they've had about 3 weeks of the cool treatment in the fridge, but you can leave them all winter and plant the next spring if you like. Plant your seeds in a container that you can monitor for the best results. This way, you can watch over your seedlings and give them proper amounts of water and light. When the sprouts appear, they will look like little onions, but quickly start to grow. Your little plants are ready to set in the garden when they are about hand high if the weather agrees. You don't want them having to struggle in 100+ degrees or below freezing temperatures until they've had a chance to develop a good root system. Most hybridzers time their plantings so that they can set their seedlings out in spring or early summer. Others, set their containers in the garden and just let nature take its course, believing that the ones that survive are the toughest. Either way, it is a fun hobby. Daylilies make excellent garden plants and do well in a mixed border. The foliage is generally attractive when the plants aren't in bloom and they require very little care. A nice natural dye can be made from the blooms and the buds and flowers are edible. (just don't spray pesticides nearby) For a new gardener just starting out, or an experienced gardener who likes low maintenance, daylilies are an excellent choice. There is a form and color that suits just about any garden style and the tough-as-nails plants are quite forgiving. Daylilies are fun to trade and share among friends and we have a friendly and active Daylily Forum in our subscriber area where enthusiasts compare notes and plants in many corners of the world. Daylilies are some of the easiest plants to ship by mail because of their fleshy root system. Vendors will ship bare-root plants wrapped in newspaper during the spring. Collecting daylilies is extremely addictive and like the proverbial potato chip, you can't stop with just one!